FIGURE 19-5 Members of the EGF superfamily. Cysteine bridges are indicated by solid black lines. 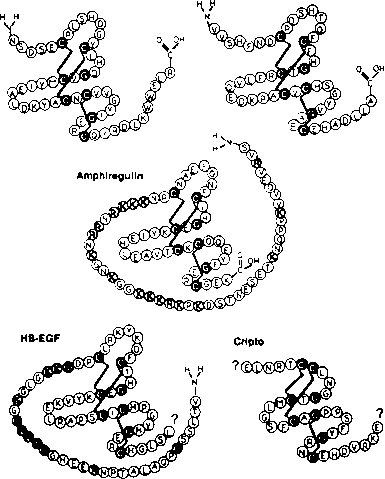 Conserved amino acids are shown in black, and positively charged residues in the N-terminal extensions of HB-EGF and amphiregulin are indicated by shaded circles. All members of the EGF family of mitogens contain a highly conserved 36- to 40-amino acid motif, containing six cysteines that link internally to produce three peptide loops. In addition, all members of the family are synthesized embedded within larger precursor proteins. All three forms of TGF-a are capable of activating EGF-TGF-a receptors. Reproduced with permission from Russell, W. E., and Van Wyk, J. J. (1995). Peptide growth factors. 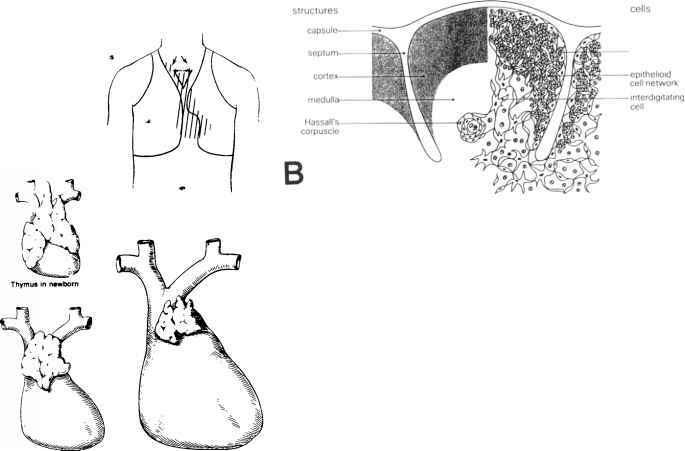 In "Endocrinology" (L. J., DeGroot, ed. ), 3rded., Vol. 1, pp. 2590-3623. W. B. Saunders Co., Philadelphia, PA. FIGURE 19-6 Signal transduction of EGF-R.
AA while receptor dimers aa and a/3 bind PDGF-AB, and all of the receptor dimers, including /3/3, bind PDGF-BB. The PDGF-receptor complex is internalized and degraded, and the signal transduction process set off by the growth factor-receptor complex has already been indicated (Figure 19-4). PDGF promotes cell division and does this by inducing a state of competence to undergo DNA synthesis. Other growth factors in the PDGF-stimulated cells are involved in progression through the Gi phase of the cell cycle on the way to the S phase. As mentioned earlier, PDGF also functions in smooth muscle cells and fibroblasts as a chemoattractant, although other growth factors involved in progression are not required for PDGF to exert chemoattractant activity. PDGF is also involved in wound healing, and it is responsible for the appearance of macrophages in wounds where fibroblasts and endothelial cells replicate as part of the wound-healing process under the influence of PDGF. PDGF may also be involved in atherosclerosis, where initial injury to the intima can lead to platelet aggregation and degranulation. 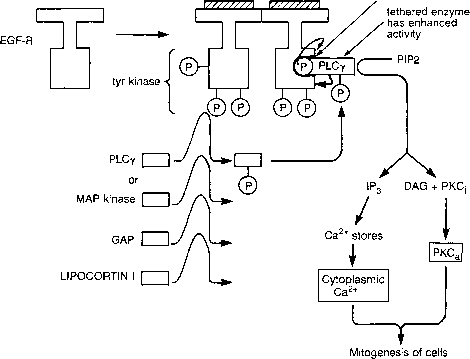 In this process, PDGF is released and smooth muscle cells migrate to the site and cause the sequestering of lipids. PDGF may have other important activities.